I’ve been a bit quiet on the beer reviewing front lately, but with the potential for a big year in beer on the cards for 2017, I’m getting back on the horse. 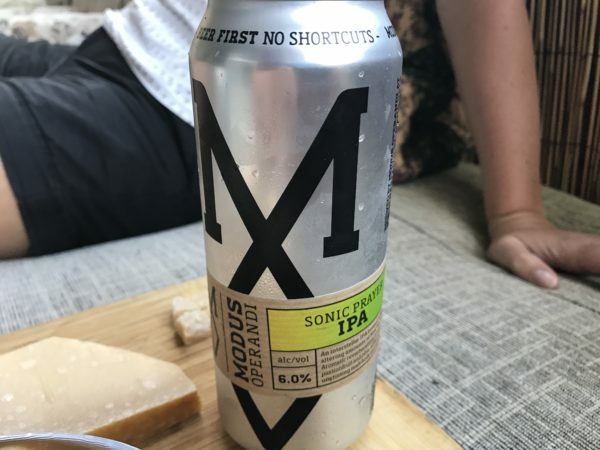 The Modus Operandi beers a good start. Brewed not far from me in Mona Vale, this small operation continues to pump out the sort of beers I want to drink. Packaged in glorious 500ml cans (and with growler fillups at a few local craft beer establishments) these are good brews, full of interest. This Sonic Prayer is an ‘interstellar IPA’ brewed with new world hops. Lots of piney galaxy hops on the nose methinks, backed by a palate with minimal malt but plenty of hop driven bitter punch. Some may criticise this style as all hops and no tail, but personally I love the hit here just like I do the punch of a young Watervale Riesling. High quality. 4.5 stars. 6%. Would I buy another? Absolutely.